Sailing is definitely a family affair. But what if your family cruising includes furry, feathered, and spiny critters? 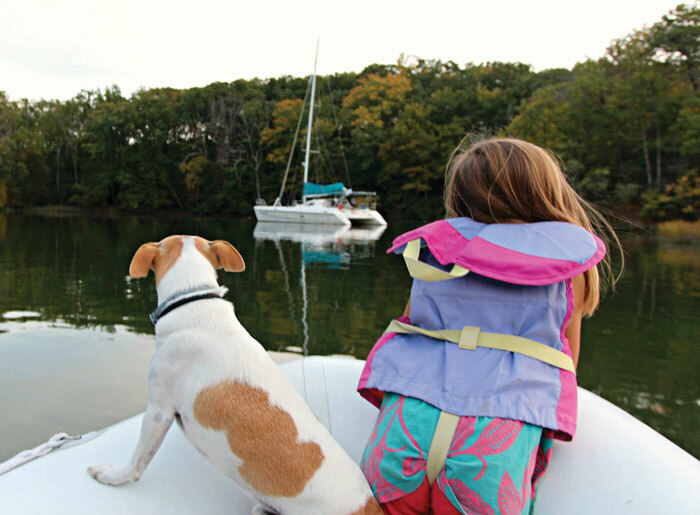 Keeping your pets safe and happy on the water takes some planning. Animals need many of the same things we people need when out sailing. ...only they can’t complain about it when they’re lacking. A primary concern is just keeping your pet on the boat at all times. 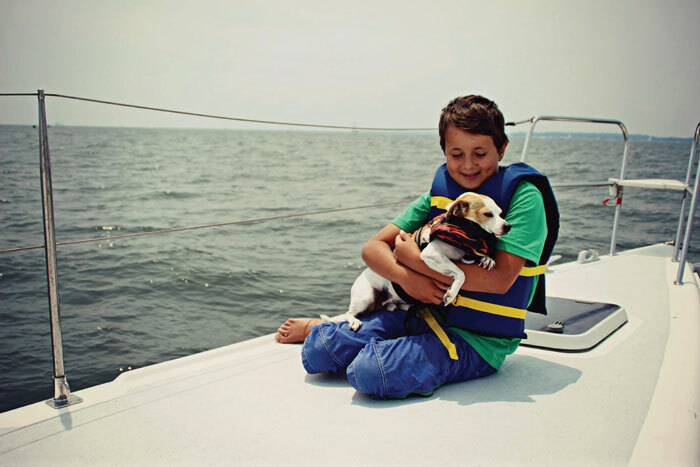 Dogs and cats can end up overboard in a blink, and they can’t call for help once they are in the water. Sometimes an excited pup might jump in chasing a bird or a wave; other times a dog or cat might just skid and slide right under the lifelines. Lifeline netting is popular with boating pet owners. Training your animals to stay in the cockpit, or securing them there is a good preventative step. There are PFDs for cats and dogs, and many marine stores will allow you to bring your animal in to try them on. A good fit is important for comfort and safety. Dogs and cats will tire out quickly and drown without the aid of a PFD. There are some important things you can do to assure you get them back to you. A PFD is your first line of defense, but adding some reflective tape or a waterproof light will help track your pet even after dark. Always make sure your animals have a collar with a tag that has complete contact information so that your pet can be returned to you if they are found by another boater. And practice those man overboard drills, because the overboard one might be man’s best friend. This is as important as it is for you. Sometimes, your animal might be too uncomfortable or not feeling sure footed enough to walk down below and find a water bowl. Have some water on hand and offer it to your cat or dog frequently. If your furry mate is prone to seasickness or doesn’t seem to be wanting water, try offering ice to lick. Know the signs of dehydration for your particular pet, as they won’t be able to tell you they’re thirsty. Keeping your pet shaded and cool is critical too. Make sure they have a place to tuck away that’s well ventilated and out of the sun. And talk to your vet before thinking about shaving a furry critter to “keep it cool.” Often thick coated breeds use their fur to keep them cool and will overheat otherwise. Getting them to do their business. The final business is how to get your pet to do their business out on the water. Most house trained pets will not soil a boat, and teaching an old dog new tricks doesn’t always work out. You need to plan your trip around your pet needing to relieve himself at some point. 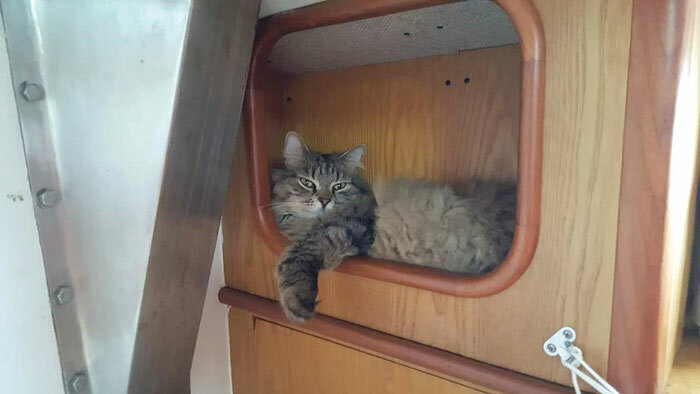 A litter box is portable, but a good tree to lift a back leg on is not. Some longterm cruising dogs have been trained to do their thing on a piece of artificial grass, in a litter box, or on newspapers. Dogs can hold it for a long time, but it doesn’t mean they should hold it. Talk to your vet about keeping your dog healthy for long passages. Sailing with a furry ambassador is well worthwhile. So much to think about, but the benefits make it all worthwhile, just like pet ownership on land. 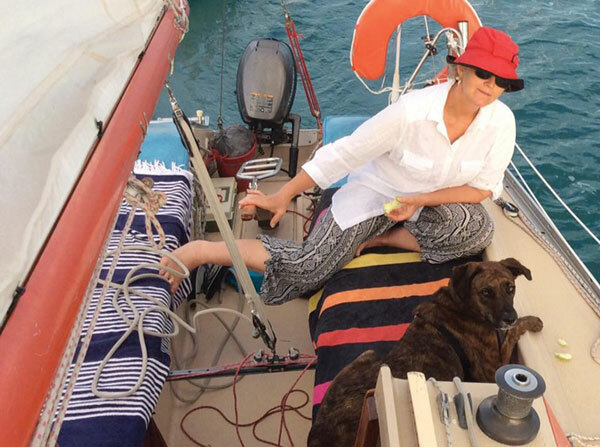 Pets are great company on watch; they snuggle you when you’re resting, and we’ve found that sailing with our pet is a great way to meet new friends with a furry ambassador leading the way. We have met people sailing with dogs, cats, mice, rats, hedgehogs, monkeys, parrots, and all kinds of reptiles. But I don’t think you can get a lizard PFD.